Lens Description: The EF-S 18-55mm f/3.5-5.6 IS STM Lens from Canon is a standard zoom compatible with Canon APS-C format cameras. 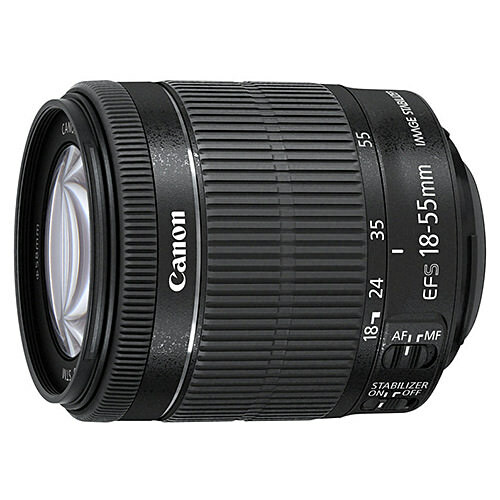 It features a focal length range of 18-55mm (35mm equivalent: 28.8-88mm) and an Optical Image Stabilizer providing the equivalent of up to four stops of shake correction. A high-precision aspherical element reduces chromatic aberration throughout the zoom range for high resolution and contrast. The lens supports Canon's EOS Movie Servo AF feature for smooth and quiet continuous autofocusing during movie recording. This feature is enabled by the use of a six-group zoom system plus a stepping motor focusing mechanism. Additionally, manual focus adjustment is possible while shooting in AF mode, and an internal focusing system maintains an overall compact lens form-factor, enables faster performance, and allows for a closer minimum focusing distance of 0.82'. The front element of the lens does not rotate during focusing, allowing you to use polarizing filters without a problem. Optimized lens coatings ensure precise color balance while minimizing ghosting and flare, and the 7-blade circular diaphragm produces pleasing background blur.